WonderCon 2013 returned to Anaheim after last year’s experiment, and the event felt more solid this year. As much as I hope they’ll be able to return to San Francisco, they’ve shown that they can put on a really good convention in Anaheim as well. 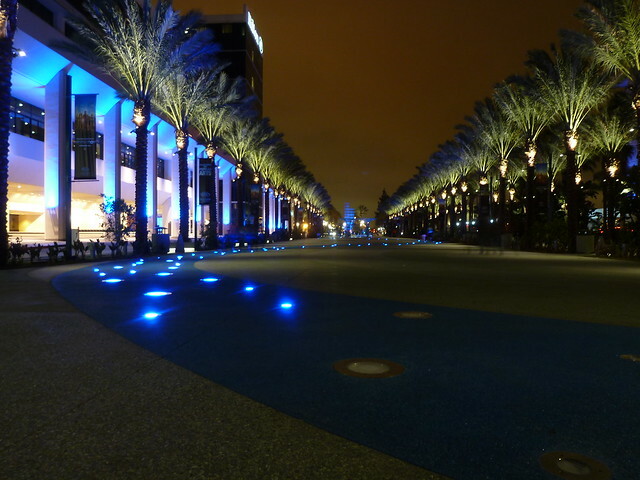 Since last year, the Anaheim Convention Center has replaced a long driveway between hotels with an extended pedestrian area, with fountains at either end. This turned out to be fantastic for the convention, because it gave people a place to hang out, visit, hold photo shoots, and more. This was also where five food trucks set up shop to handle the lunch rush, which added not just supply but more variety. 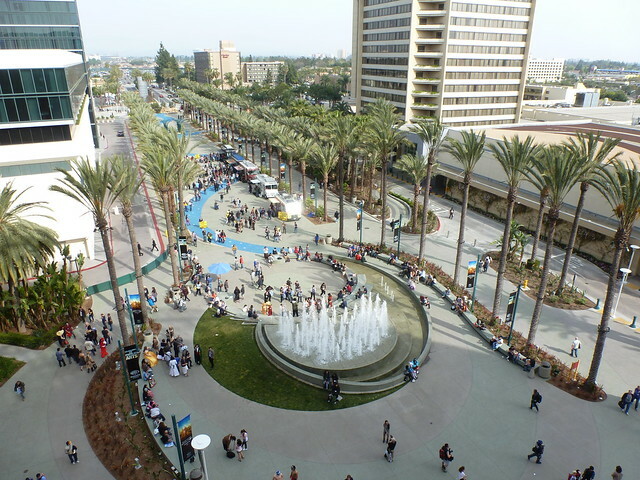 Compare to San Diego, where most exits from the convention center make you cross a driveway, a major street, and two sets of railroad tracks, one for freight and one for the trolley, before you get to any sort of open space, and even that has been co-opted by off-site events. Another difference from San Diego: The sections of the main hall are separated by permanent walls, including the food courts…and as I discovered on Friday, an atrium. That atrium was a bit of a shock the first time I walked into it, because it gave me an overwhelming sense of deja vu, like I’d just walked out of WonderCon 2013 and into WorldCon 1996. I could swear it’s left over from before the major remodeling they did in the late 1990s. The separation wasn’t as much of a problem as I’d expected, though, as they were able to divide up the halls thematically. Hall A was mostly dealers, while the larger Hall B featured exhibits, publishers, artists and so forth. The only issue was the presence of an ice cream stand in the bottleneck, which wasn’t a problem in itself so much as it encouraged you to buy ice cream on the way to the dealer’s area. I was pleasantly surprised that they allowed me to pick up Katie’s Saturday badge along with both of my own badges on Friday morning. San Diego has gotten very strict about badge pick-up, and even a few years ago at WonderCon, if you had multiple 1-day badges you had to pick them up each day. Like last year, I went solo on Friday and we both went on Saturday. This time, though, we didn’t come back Sunday with our two-year-old, now that we know there isn’t really much of anything aimed at kids that young. 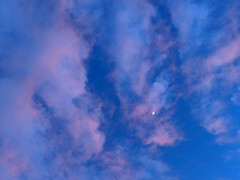 Unlike last year, Friday didn’t feel light at all. In fact, I went by to check on the line for exclusives at the Graphitti booth and every time I checked on Friday, it was halfway down the hall or longer. (By Saturday afternoon, though, the line was gone and they hadn’t run out.) Neither day even approached SDCC-level panic-inducing crowding, though, which I very much appreciated. 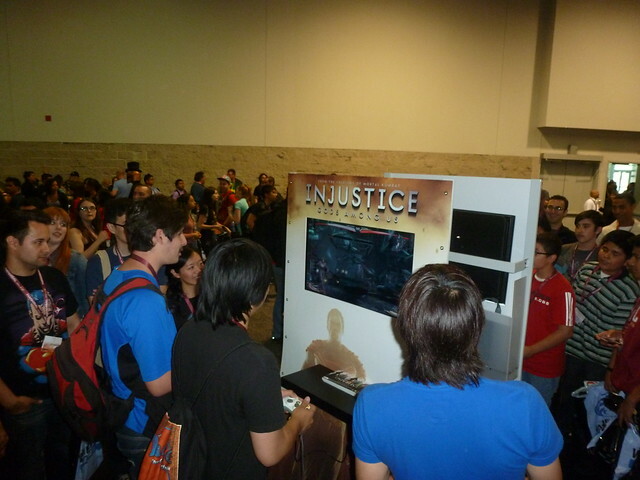 Speaking of the Graphitti line, you can see it in the background of this shot of people playing the Injustice: Gods Among us demo at the DC Comics booth. Neither of us bought much this year, though I was tempted to pick up another volume of Absolute Sandman. 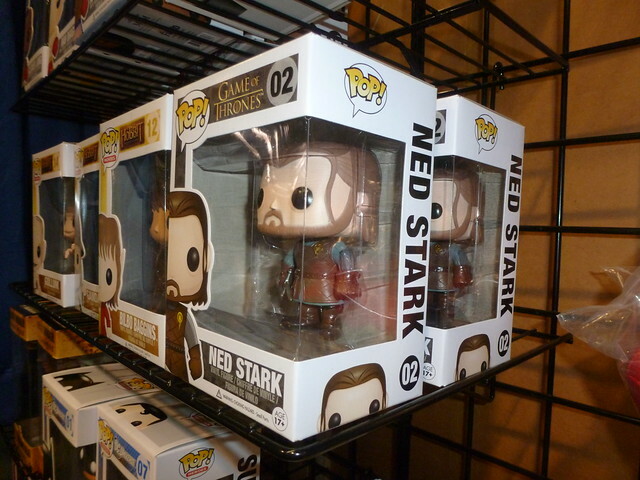 And I find it hilarious that Pop Funko actually has a Ned Stark figure. My first thought (terrible, I know): Does the head come off? I did, however, check out some old Silver Age Flash comics. 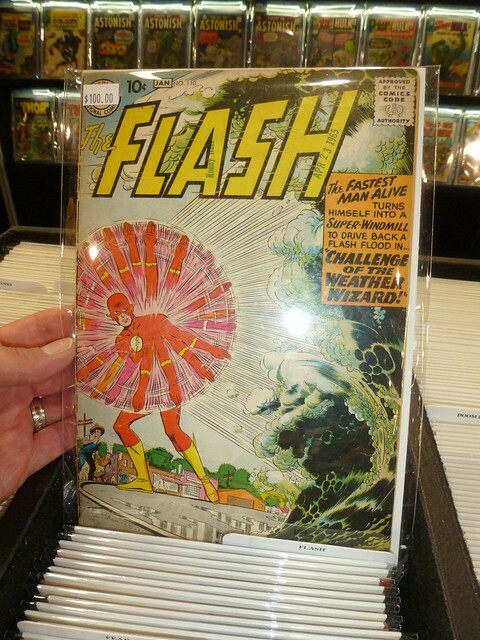 I’m more of a reader than a collector (I collect so that I can re-read), and I picked up the early stories in the Flash Archives reprints, and the not-quite-so-early stories in the cheapest, most beat-up copies that were still readable. But there’s still something about holding a well-preserved copy of a landmark issue. I also tried to catch Flash co-writer Brian Buccellato, but he wasn’t at his table when I went by. I didn’t notice any particular theme overwhelming the costumes, though I’ve noticed Captain America and Iron Man have become a lot more popular over the last few years. 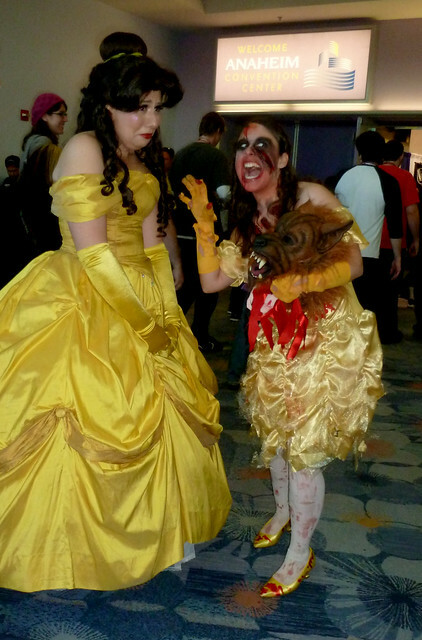 Disney Princesses, and riffs on the characters, also seem to be popular at all the Anaheim cons I’ve been to — location, I’m sure. 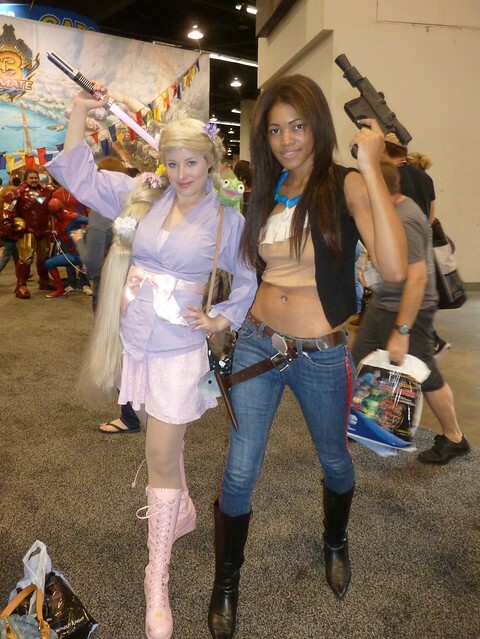 My favorite variation was the pair dressed as Jedi Rapunzel and Poca-Han-tas. 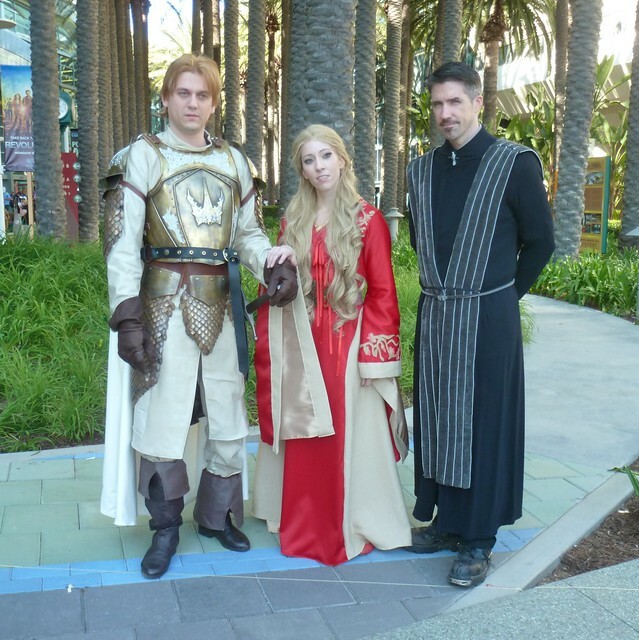 There were some incredible Game of Thrones cosplayers (not surprising, given the Season 3 premiere was coming up on Sunday), including the guy on the right who actually looks like the actor who plays Littlefinger. About a half hour into the first day of the con, my camera broke. I’m still not sure what went wrong, but it refused to focus or turn off. I was eventually able to reset it, but it would consistently focus way too close unless I forced it into another mode. Oddly enough, setting it to “take a picture of my food” mode worked best for scenic shots. Odder still, the problem cleared up the next day. That meant that I used my phone’s camera a lot more than usual on Friday, which in turn meant more photos on Instagram. It also meant more battery drain, especially with the two panels I live-tweeted. Fortunately, I’d just changed a lot of settings to cut down on battery use, and the phone actually lasted longer than it used to on a typical workday. Score! For the most part, they seemed to have matched room sizes to audiences fairly well (at least for the events I tried to go to). 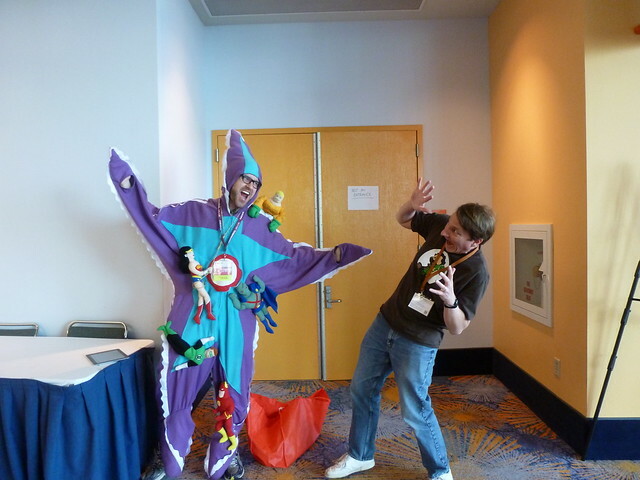 I only really had trouble getting into one panel, and I had arrived late for that anyway. J.M. DeMatteis remarked that he didn’t think there were stale characters, only stale interpretations. Mark Waid pointed out that 20 years ago no one would have thought that Green Arrow would have his own successful TV show. Some elements are only iconic because of their weight of history – ex. Superman’s trunks, the name “Spider-Man,” etc. If someone were to create those characters now, people would think they were silly, and you’d have an uphill battle to sell them. We were both looking forward to the Animaniacs 20th Anniversary (I feel old now) event Saturday evening. Sadly, it was canceled. Worse, this wasn’t communicated to the staff at the room door. Katie heard a rumor of its cancellation (she was wearing an Animaniacs T-shirt, and someone figured she might know), so we went to the door, and it wasn’t on the room schedule…but usually, cancellations are printed and marked as canceled. We asked, and were told, no, it’s just been postponed. So we came back later, and found out no, it was canceled. Then there was the panel hosted by the authors of Law and the Multiverse and Broadcast Thought about the legal side of a zombie apocalypse. Think about it: Are zombies technically alive or dead? If they’re alive, they’re humans suffering from a mentally-impairing disease. If they’re dead, we have laws about treatment of human remains. It culminated in a mock trial. It was the sanity phase of a murder trial in which the killer had been a (curable) zombie at the time the police discovered the body, but who had been lucid a few hours earlier…and had motive for murder. It all came down to whether the defendant had become a zombie before or after the killing, and thus whether he was in his right mind and could be held responsible for his actions, or not guilty by reason of insanity. 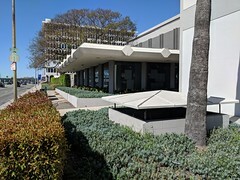 The audience voted not guilty, though they pointed out in a real trial the jury would have to be unanimous. Parking was a problem again, and while I never had to park as far out as the stadium (Garden Walk is at least within walking distance), I was infuriated by the poor signage on Saturday. After spending an excruciatingly long time waiting to turn right onto Harbor, I was confronted with a sign saying to make a U-turn and then turn back onto Katella going the same way I’d been going before. I could have saved 10 minutes or more of waiting in traffic by just going straight through. A friend of mine thought it odd that WonderCon should have so much trouble with parking when it’s smaller than Anime Expo, which he told me used to take up the entire convention center and still managed with just the local parking structure. I did some digging, and it turns out that while AX used more floor space, attendance was comparable or lower when they were in Anaheim. AX pulled in 40,000 people in 2006, the last year they were here, up from 33K the year before. 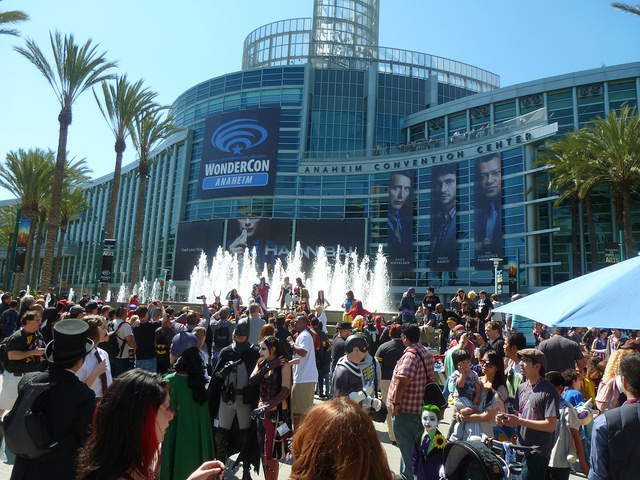 I can’t find WonderCon estimates for this year or last, but they had 39K in 2010 and more in 2011. Of course, those were both in San Francisco. Maybe anime fans carpool more? Or parking availability has changed since 2006? Either way, if parking melts down at 40K, imagine the nightmare of parking Comic-Con International’s 140K+ attendees. I suppose it won’t be quite so bad — I’d bet a higher percentage of people at CCI are traveling from out of town, which means they’ll be parked in hotel lots or coming from the airport by shuttle or taxi. WonderCon ran the weekend of March 29-31, 2013. I attended by myself on Friday and we both went on Saturday. 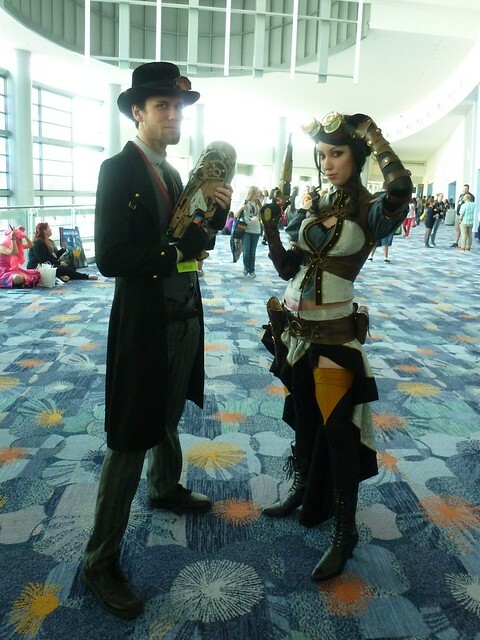 Check out the rest of my photos from WonderCon at Flickr. 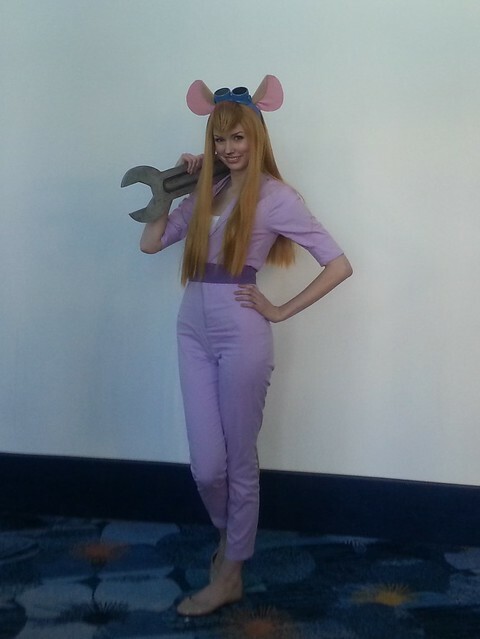 This entry was posted in Comics, Conventions and tagged Anaheim, Long, WonderCon, WonderCon 2013 on April 14, 2013 by Kelson. Regarding the parking, I agree with you that the signage was terrible. If we’d tried to follow it, it would have been a huge pain. 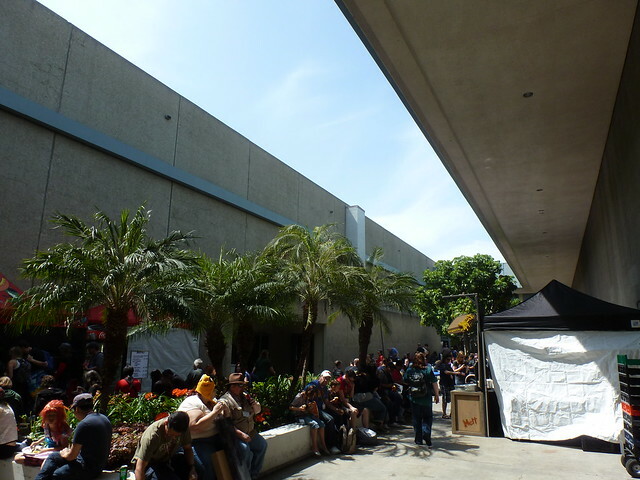 However, the website for the con showed all the Convention Center lots, and also directed people to the “overflow” Toy Story parking lot at Disney, and that’s what we did, both Saturday and Sunday. It worked out great. The parking attendents asked if you were for the Convention or Disneyland, gave you the Convention rate and directed you to the parking nearest to Harbor. Both days all we had to do was walk the length of the street/mall from Harbor to the Convention Center. The Toy Story lot *was* the one we tried to go to on Saturday.